HEAT up milk with heavy cream, 1/2 tablespoon sugar, pinch of salt, cinnamon and cardamom pods in a small saucepan for a few minutes. LET cool off and cover with the lid. LEAVE the sauce overnight for extra flavor, but this is not necessary. BEST to leave it for at least half an hour. MAKING your own pasta dough is easy and super delicious. You can of course purchase fresh pasta at the supermarket if you like. You’ll only need to fill up a large pan with water and a pinch of salt, then bring to a boil. PAT the deer steaks dry using paper kitchen towels and season with pepper and salt. 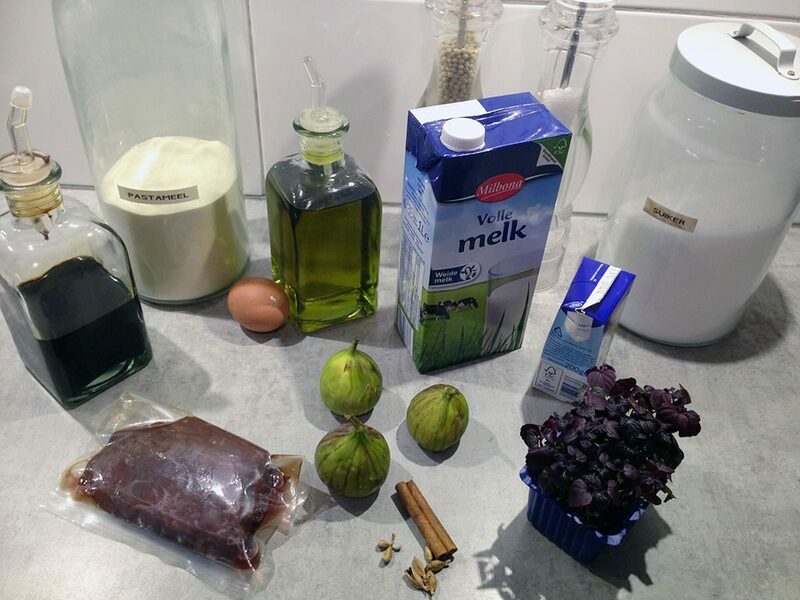 REMOVE the stems from the fresh figs, then slice the figs into 4 equal parts. REMOVE the cinnamon sticks and cardamom pods from the milk and pour into the whipped cream dispenser. You can use a milk frother or immersion blender instead of the whipped cream dispenser if you don’t have one. 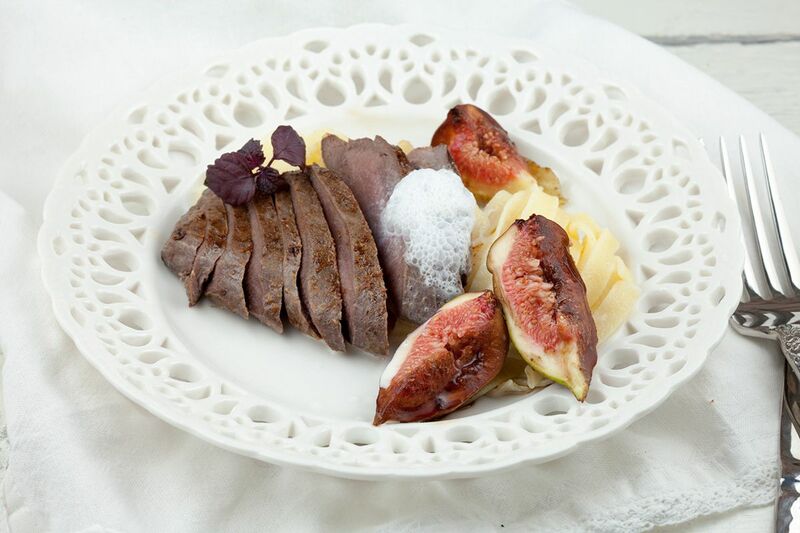 HEAT UP olive oil into a medium-sized skillet and cook the deer steaks on medium-high heat for 2 minutes on each side for medium-rare. COOK for a little longer if you prefer steaks that way. REMOVE the steaks from the skillet and let sit for a few minutes. 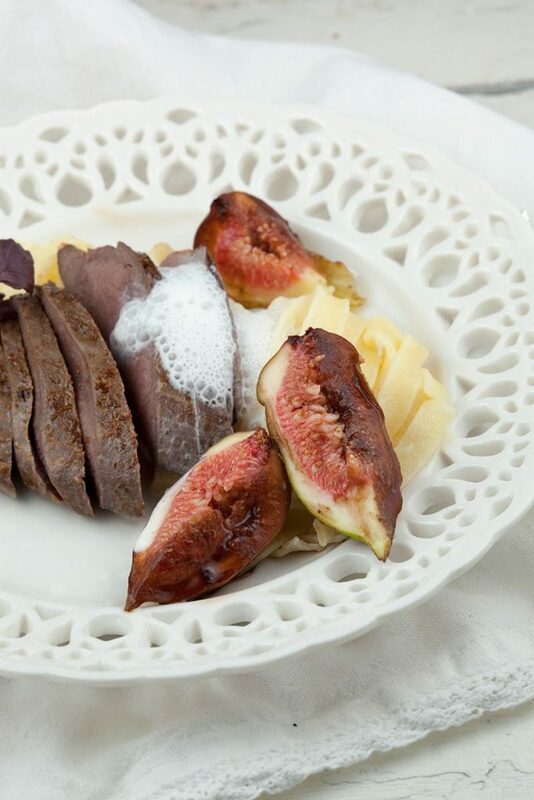 HEAT UP olive oil in a small skillet and cook the fresh figs for a minute, deglaze with balsamic vinegar and cook for another minute. MEANWHILE cook the pasta, fresh pasta only needs a few minutes. DRAIN afterwards. 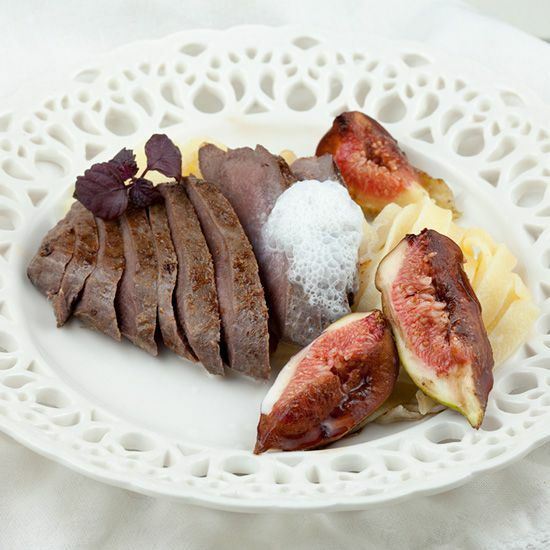 DIVIDE the pasta over middle of the plates, slice the deer steaks and serve with fresh figs, cinnamon foam. GARNISH with an edible twig (optional).